I acquired this meter after I'd owned the Model B version for awhile, so please see that page for more info. This page will mainly be a comparison of the A and B models. (I also have a Model C and Model D) . Physically, they're pretty much identical except for the calculator dial on the front. The cases and the battery chambers are the same, and the function is certainly the same. The only significant difference is that the "A" model's calculator dial is calibrated in 1/3rd stops, and the "B" model is in full stops. That makes the latter much less crowded and easier to read, but also less precise. Since most cameras I own have their shutters and apertures set in full or half-stop increments, I think the "B" model is adequate (since it's obvious when to set the camera on a full stop or when to set it on a half stop). Considering that it was designed to be used with forgiving, slow B&W emulsions, dead-on accuracy and repeatability wasn't a high priority. Another significant difference is the back plate. 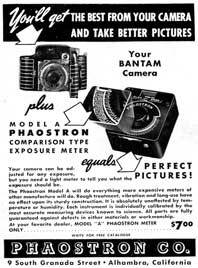 My "B" model says it's manufactured by Phaostron in Alhambra, California. My "A" model says it was made by Mitchell Instruments in Los Angeles. Phaostron is still in business, but of Mitchell I know nothing: there's a Mitchell Instrument extant, but they began in 1975. So was this Mitchell Camera, which manufactured motion-picture cameras and equipment for Hollywood? 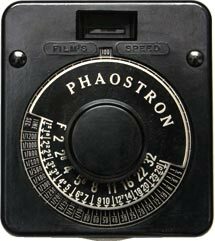 Or was it a different company which had Phaostron as the trade name, and the trade-name became the company name (e.g. Graflex, Rollei, and to some extent Kodak)? Don't know. Probably never will.